... then where have you been for the last 30 years! Matienzo is a closed valley in the Cantabrian mountain region of Northern Spain. It's a closed valley so the river flows out of it through an active cave. The valley with its farms, houses and bars is about 10 miles from the Atlantic coast and about 30 miles from Santander, a major port. To get to Matienzo, it is now quite easy to take the ferry from Plymouth to Santander (about 22 hours plus journey time in UK), to fly Ryanair to Santander (2 hours) or to drive down through France (about 24 hours continuous driving or two days in more comfort). 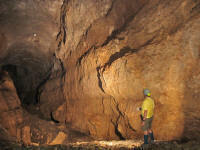 The appeal of Matienzo is mostly in its caves, especially the ones that have not yet been discovered and explored. The rest of the appeal is in the company, the local villagers, the bars, the beach, the river and, when it shines, the sun. 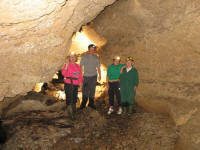 Every year, a few more miles of cave are found by the hard cavers and a few more feet by the DCC. The valley is surrounded by hills varying from 300 m to 600 m above valley bottom and there are caves in most of these hills. 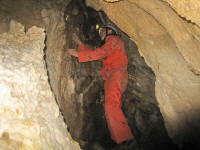 We usually think of there being about three main systems (South Vega, North Vega and Four Valleys) but there are now over 2000 cave sites ranging from 40 km systems to 4 m deep shafts. The DCC members who go to Matienzo support the activities of probably 70-80 cavers, friends and family members who take part over the summer. 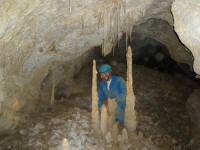 We have a strong reputation for digging but also take part in original exploration, surveying and so on. This year was no exception with the group roughly dividing into three with Simon and Allan working on a number of new finds at Sel de Suto in the west end of the Vega valley, Tony, Pete and Nigel in the northern arm below 'Pants' and Len, Bill and Geoff below the TV mast in the east end of the Vega valley. This is of course only a rough split as we all visited other areas as well. Apart from these trips, Simon and Allan got on a pushing trip in Biggo (Cueva Llueva). A number of other sites were visited while we were there. A large group paid a visit to Coventosa (all except Liz, Geoff and Lucy but with Jenny, Mike and Carolina), and spent a lot of time photographing. Tom went down and up his first elektron ladder and also served as a very patient flashgun holder. On this trip, we even took a picture of four committee members underground together; if Pete had not already left to go home, we would have been quorate underground (picture right by Kieran on Simon's camera) and could have held a committee meeting without risk of being overheard. On another day, we made a visit to 489 cave, also known as Billy's Dream, to pay our respects to Roy whose ashes were spread there three years ago. Yet another trip was a quick stroll through Jivero II, one of the early 'finds' in the valley in which you can go from sink to resurgence (or vice versa) (picture left by Nigel.) Nigel paid a visit to Cueva Coquisera (picture lower right by Nigel), a massive cave near Cruz Usano which Pete, Lenny and Billy have visited in previous years. Apart from trips to Ramales, the beach (by the way, Ajo has a much better beach than Isola or Nona) and the Ason at Riva, two carloads went over to Cueva Soplao in the foothills of the Picos. Unfortunately, this showcave is incredibly popular and although we arrived at about 1 pm, the first available tickets were for 9 pm that evening! One event we did miss was the funeral of Pepe, one time owner of the Snows bar but having attended German's funeral three years before, we thought that the kids (Lucy and Tom) might think we were winding them up by taking them to a funeral every time they come on holiday with us. This was made up somewhat by Tom having the opportunity to watch a goat being dissected at the Baker's Bar (until Jenny and Mike spotted that the goat had TB and we rapidly retreated). Pablo's bar was well supported every night and one evening was enlivened by Kieran's 18th birthday. There was also a traditional expedition dinner in Pablo's with more than 50 people and a live cabaret afterwards. The cabaret was MC'd by the tuneful Mr Andy Pringle and Nigel managed to surprise most present by his rendition of Caving Matilda and a version of 'The Muddy Campsite Blues'. One other event which was kept very secret was a 'caving birthday' meal for Nigel (and of course Len and Geoff) to celebrate more than 30 year since their first visit in 1976. Because Nigel could not get to Matienzo in 2006, this had to be a year later than it should have been. The weather was fairly kind with only two wet days (I think) which did not really stop us doing much. It was soon hot and sunny again so we were able to dry everything off within a day or so. All in all, a good expedition - see you there next year?